Don’t call it a closure! Keep calm and share science! This week, after 23 months of hard work involving about 1000 people every day, the key to the LHC was symbolically handed back to the Operations team. The first long shutdown is over and the machine is getting ready for a restart that will bring its beam to full energy in early spring. 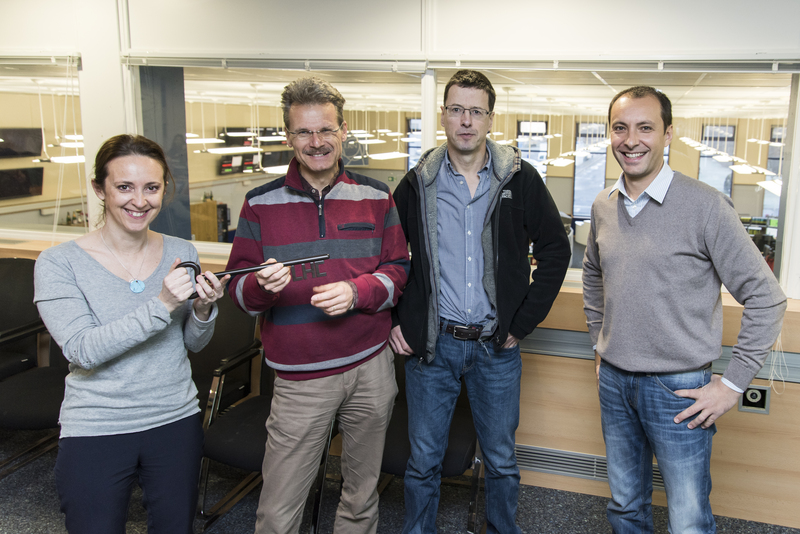 Katy Foraz, LS1 activities coordinator, symbolically hands the LHC key to the operations team, represented, left to right, by Jorg Wenninger, Mike Lamont and Mirko Pojer. All the departments, all the machines and all the experimental areas were involved in the first long shutdown of the LHC that began in February 2013. Over the last two years, the Bulletin has closely followed all the work and achievements that had been carefully included in the complex general schedule drawn up and managed by the team led by Katy Foraz from the Engineering Department. “The work on the schedule began two years before the start of LS1 and one of the first things we realised was that there was no commercial software capable of dealing with the complexity of LS1,” she recalls. “The solution we found consisted of splitting the whole project into many subprojects. I then did some coding to compile all the information into a single file. For LS2, we are working on replacing this cumbersome procedure with an ad-hoc CERN-made piece of software that extracts information from the IMPACT database.” PlanBook, the new software, will return information about the different activities, their safety requirements and the technical constraints that determine the access rights to the various zones of the tunnel. The first of these is the qualification of all magnet circuits for operation at the 6.5 TeV level. One of the principal hurdles here is the need to train the superconducting dipoles to their 6.5 TeV current level. Training involves ramping up the main dipole circuit of a given sector until a quench (a transition to the resistive state) of a single dipole occurs. The Quench Protection System swings in action, energy is extracted from the circuit, and the current is ramped down. After careful analysis, the exercise is repeated. Next time the magnet that quenched holds the current (i.e. it has trained), and at a higher current another of the 154 dipoles in the circuit quenches. For 2015, 11,080 A is the target current (6.5 TeV with some margin). Sector 6-7 was successfully brought to this level before Christmas, and took 20 training quenches to get there. Getting all 8 sectors to this level will be an important achievement. While the qualification of the magnet circuit is ongoing, it is hoped that the tests can be paused for a weekend to perform a sector test. This would inject beam into the LHC again for the first time since February 2013. The aim is to bring single bunches from the SPS through the LHC injection regions at Points 2 and 8 into the LHC for a single pass through the available downstream sectors. This is an interesting exercise, which would allow the testing of synchronisation, the injection system, beam instrumentation, magnet settings, machine aperture and even the beam dump. A full circuit of the machine with beam and the start of beam commissioning proper is foreseen for March. It should then take around two months to: re-commission the operational cycle; commission the beam-based systems (transverse feedback, RF, injection, beam dump system, beam instrumentation, power converters, orbit and tune feedbacks, etc. ); and commission and test the machine protection system to re-establish the very high level of protection required. This will open the way for the first collisions of stable beams at 6.5 TeV sometime in May - initially with a low number of bunches.